A Rally by Sir John Lavery, 1885. “As a nation we ought to welcome the healthy, hearty girl who can beat her brother in managing a tennis ball, in rowing a boat, and very often in managing a frisky horse.” — Ladies Home Journal, 1891. The game of lawn tennis was invented in the 1860s by retired British army officer Major Walter Clopton Wingfield. Women’s clothing was not very helpful in combating these unfortunate stereotypes. 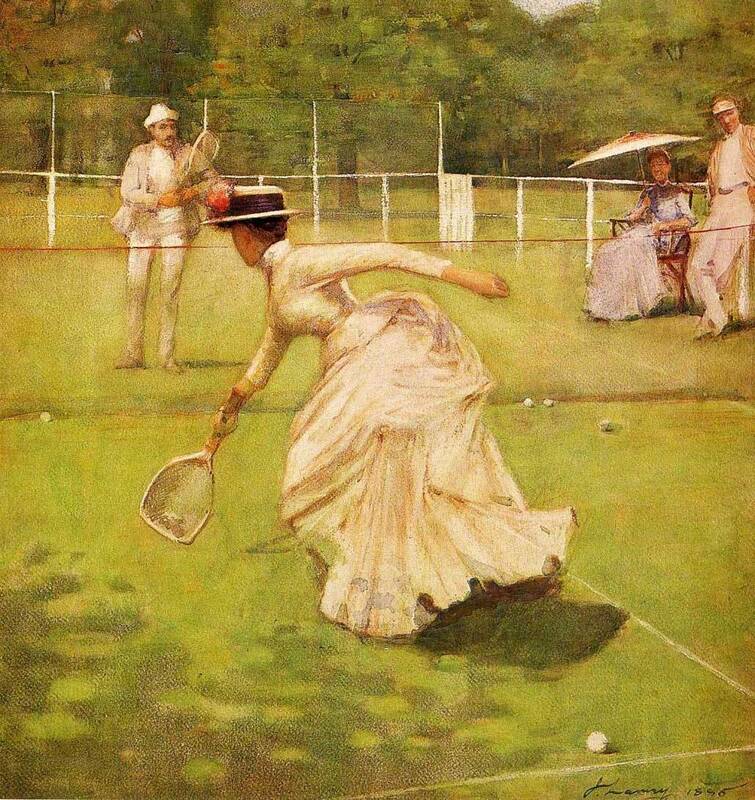 In the late 1870s and early 1880s, for example, women simply wore their ordinary day dresses to play lawn tennis. Sleeves were long and skirts often brushed the ground. Wide-brimmed hats made it impossible to see overhead and heeled boots further impaired a lady’s movements. Add to that, women playing lawn tennis were expected to wear all the layers of normal dress, including corset, petticoats, and bustle. Most ladies of this time period would wear a pinafore or an apron over their day dress to protect it from dirt and grass stains during play. As you can see in the below example, these tennis aprons usually had pockets to store extra tennis balls. Tennis Dress, The Woman’s World, 1889. “Some years ago it was thought that almost anything would do for a tennis costume, and the result was sometimes appalling. The player of today has rather more idea of the fitness of things, and does not appear on the courts in a woollen skirt, too long and much too heavy, a waist that certainly was never intended for the tennis court, and an absurd little visored cap that neither shelters from the sun nor adds to the appearance." Atkinson goes on to recommend a plain tennis dress with a full skirt, approximately “three yards and a half round” and “made to clear the ground by about four inches.” For color, Atkinson advises that “white is prettier for tennis than anything else.” For fabric, she suggests a lightweight piqué, well starched. As for trimmings, Atkinson writes: “All ribbons, bows, in fact all fussiness should be dispensed with in the tennis costume. The simpler it is, the better." Though women’s tennis costumes were much more practical at the end of the Victorian era than they had been in the 1870s, they were still relatively restrictive—especially when compared with tennis costumes of today. Nevertheless, many talented sportswomen of the Victorian era were able to make a name for themselves in competitive play. In 1884, Maud Watson became the first female champion at Wimbledon. She was soon followed by Wimbledon champions Blanche Bingley, Lottie Dodd, Lena Rice and Charlotte Cooper. English Tennis Champion Charlotte Cooper, 1900. Charlotte Cooper would go on to win the tennis singles event at the Summer Olympics in 1900, making her the first individual female Olympic champion in history. The 2016 Summer Olympics are currently in progress in Rio de Janeiro, Brazil. Women’s tennis started on August 6 and competition will continue through August 14. There are no corsets, bustles, or long skirts, but I hope you all enjoy watching and rooting for your favorite players. This post originally appeared on mimimatthews.com. It has been reprinted with permission.